The EISF in Conversation podcast was launched in September 2017. The podcast investigates different perspectives and aspects of humanitarian security risk management. The aim is to raise awareness of security risk management, encourage a better understanding of what security risk management can achieve and start conversations in and outside the sector. The first series explores how security risk management can enable humanitarian access. Robert Cudmore is our podcast expert and the interviewer in these episodes. Robert is a podcaster best known for his award-winning series, The Audio Drama Production Podcast. 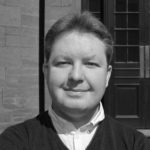 As well as producing and presenting several documentaries and dramas for radio, he is also a freelance broadcast journalist, having worked with several radio stations including BBC Radio Scotland and BBC Radio 4. He is currently a radio lecturer in Fife, on top of which he is also a freelance narrator and producer of audio-books and established voice actor.